Like I mentioned in earlier posts, technology is evolving at a very fast pace. This post will throw light on an upcoming technology which is set to disrupt most of our networking/cloud computing environments. And the name is FOG; and yes, I correctly mentioned that it may become more effective than cloud computing. Most of the IT professionals can understand the following logical diagram in a fraction of seconds - minus the Central and Edge Network thing. So, it's a pretty simple scenario - depicting a client PC (or for the time being, assume a home pc) connected to internet via some sort of broadband etc. Further the communication is happening between back-end servers, hosted on cloud. So far, it's easier to understand and hence the network beyond RED dotted line is mentioned as back-end network or compute. Now, let's understand the Edge part of it before we actually get to know the central network. On the edge (or at the last drop), the mobile devices are connected via WiFi. If these mobile devices are being used for downloading emails via the same internet connection or playing live songs or streaming videos etc, then we say that middle WiFi router is used to act as a first hop for them to connect to the internet. Now, think of the evolving scenario where you use WiFi router to stream a video stored on your mobile device to WiFi to enable smart TV at your home. In that case, WiFi router will act as middleman to route the information from mobile device in local network to a locally connected smart TV. This makes the best use of central network, where no internet connection is required. Now, coming to the advanced level communication where the mobile devices directly share information between each other and do not even require a WiFi router (for example - using ShareIt app on mobile devices to exchange information using WiFi Direct technology). These connected devices still have better data encryption, password protection, and high network performance while efficiently using the multi-core CPU of mobile devices. Data exchange is quicker than middle network and faster than usage of back-end network. 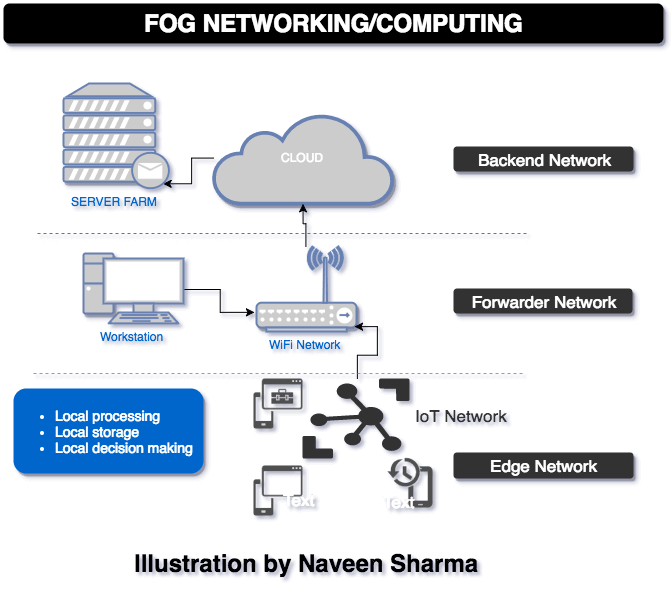 This very intra-network of edge devices is called FOG NETWORKING or FOG COMPUTING. As you can see, there are ample benefits of using FOG networks/computing over the cloud, but so far the most beneficial business case-studies are based IoT only. The one most relevant example is of UBER. Earlier, UBER app kept track of the ongoing trip and information was replicated with back-end servers. But in the case of reboot, network signal drop, or server communication failure, the trip information was lost. Application kept waiting for Server to share the data again and data sync had issues due to change in location etc. Uber used FOG computing in an exemplary way and they decided to keep all trip information recorded on the phone, even if the network signal was lost. This step shifted the responsibility of syncing the trip information, from datacenter to edge device: phone. Now, as soon as the server connection is restored, it is the driver's phone which syncs the data back to datacenter. UBER used phone's local storage, computer, and networking capability to overcome a business challenge. To summarize, though the FOG computing is evolving like any other technology, it sure will help businesses running SMART CITIES, SMART CAMPUS and other avenues, where IoT sensors will be implemented and by virtue of FOG networking / computing, information exchange will be secure, stored locally in distributed fashion, and will be processed at edge devices using local computer. That's it for now. I appreciate your comments, suggestions, and shares.